A responsive redesign of the digital e-commerce experience to provide customers with an inspiring experience that is personalized to their needs, simple to use, and continues to push boundaries of innovation. Foot Locker had noticed they are falling behind in the digital space—increased cart abandon rate, high mobile usage, poor mobile experience. Users are losing trust and interest in the brand and online sales are dropping. Because of this, their competitors are starting to outperform Foot Locker. The target customer for Foot Locker are young, fashion-forward trendsetters. They want the latest. And they want to trust Foot Locker will give it to them. They want engaging content and a rich, premium brand experience. My role was Associate Creative Director. I helped lead the overall creative from UX to UI. We worked closely with the client team to create requirements and validate our designs. Based on the user personas, we started the exploration of the visual design with the style tile above. This allowed us to create a future vision to build from and allow us to explore the overall user experience and interactions. From this, we were able to establish new typography and visual elements. We then began to apply the requirements and build out the individual pages. The new direction is meant to be bold, yet still simple. We focused on heavy typography, high contrast backgrounds, and bringing the product to the foreground. The interactions are designed to be quick and minimal, with detail, allowing the user to find what they're looking for fast. We designed an experience that allows for increased conversion rates across devices, especially in mobile. 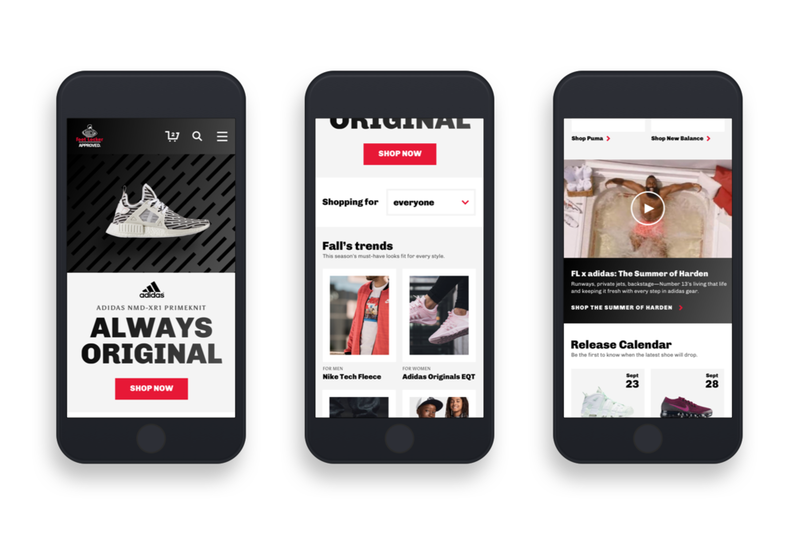 We also created a platform for rich and engaging content that will regain the user’s trust in the Foot Locker brand. All Digital Bank Juice Juice Foot Locker S'Monsters S'Mores The Children's Place The General Branding Motion & misc. Digital Bank Juice Juice Foot Locker S'Monsters S'Mores The Children's Place The General Branding Motion & misc.